Our ancestors' transition out of the water and onto the land was a pivotal moment in evolution. No longer buoyed by water, early tetrapods (animals with four limbs) had to overcome gravity in order to move their bodies. Exactly how those early pioneers first evolved the fundamental capacity to walk has fascinated scientists for many years. Fossil discoveries can tell us how and when vertebrates evolved the physical features needed to move onto land. But new research published in the journal Cell suggests that the neural circuitry needed to walk probably existed long before actual legs evolved. Because land-based animals and fish share the same circuitry today, their last common ancestor—an ancient fish which existed 420m years ago—probably also had that circuitry and used it to move around beneath the water. We already have a reasonably good idea of when fish evolved into land-based tetrapods because the fossil record documents the sequence of changes to their bodies. One of the most iconic specimens is Tiktaalik, a "transitional" fossil dating to around 375m years ago. Tiktaalik is special, because though it retains many fish-like characteristics, it also possesses wrist bones, suggesting that it could support itself on its front limbs. Fossils from rocks older than Tiktaalik lack these wrist bones, and are generally more fish-like. Fossils from younger rocks include more tetrapod-like species, with distinct digits and limbs. But the new research from New York University in the US suggests that fish needed more than just legs to learn how to walk, and in fact evolved the neural circuitry involved much earlier on. 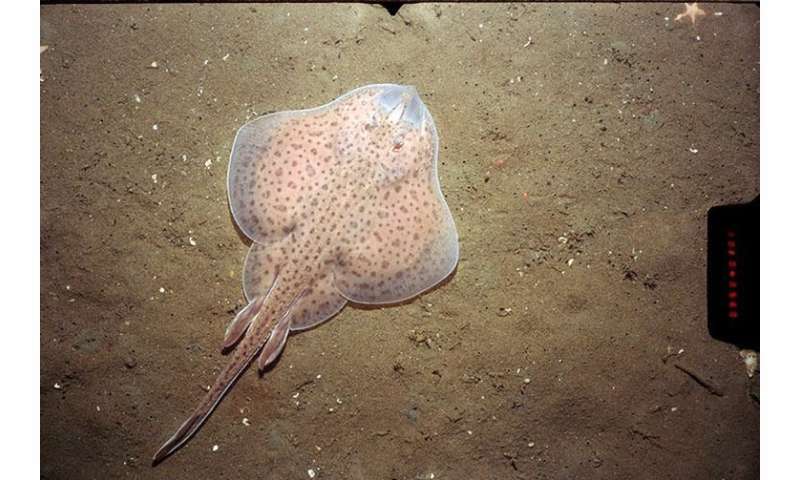 The researchers reached this conclusion by studying little skates, fish that move along the ocean floor by moving their hind fins in a left-right pattern, much as we would move our legs when walking. The researchers found that the neural circuits little skates use for their alternating fin motion are the same as those mice and other four-legged animals use for limb movement. What's more, this circuitry is produced by similar genes. Because it is unlikely that the same circuitry evolved twice, this implies that the same genes and neural pathways found in tetrapods and skates were present in their last common ancestor, some 420m years ago. This is long before the earliest fossil evidence for tetrapods, meaning that the circuits involved in walking first evolved millions of years before legs or feet first appeared. Skates aren't the only walking fish that still exist today. In fact, it's fish that are less adapted for life out of water that move in a manner most like walking, where one limb is placed in front of the other. Blind cavefish fall into this group, using their fins to walk on the riverbed and to climb waterfalls. Lungfish, which move somewhat haphazardly on land, also seem to use their fins in an alternating pattern to propel themselves along the sediment surface when in water. Scientists have also been observing how modern fish move over land, without the buoyancy aid provided by water. Obvious choices for such studies are fish that are capable of moving around on land, and regularly do so in nature. Mudskippers, for instance, move by using their forelimbs like crutches to propel themselves forward. Lungfish, on the other hand, tend to anchor the head and flip the rest of the body forward, which can sometimes leave behind marks that look like footprints. The new research is an important reminder that however good our fossil record gets, it can only show us the shape or anatomy of an organism. The genetic, neural, and behavioural features that determine what an animal does are ultimately the drivers of that anatomy. The links between living animals can often tell us as much, if not more, about our ancestors as fossilised bones and footprints. "Ancient fish had evolved the neural circuitry required for walking before the late-Devonian vertebrate land invasion"
- why would that happen? It flies in the face of the "evolution" myth. How do you get neural circuitry before the hardware?!? And if the circuit was there all along, then no evolution, right? What Am I Missing Here? 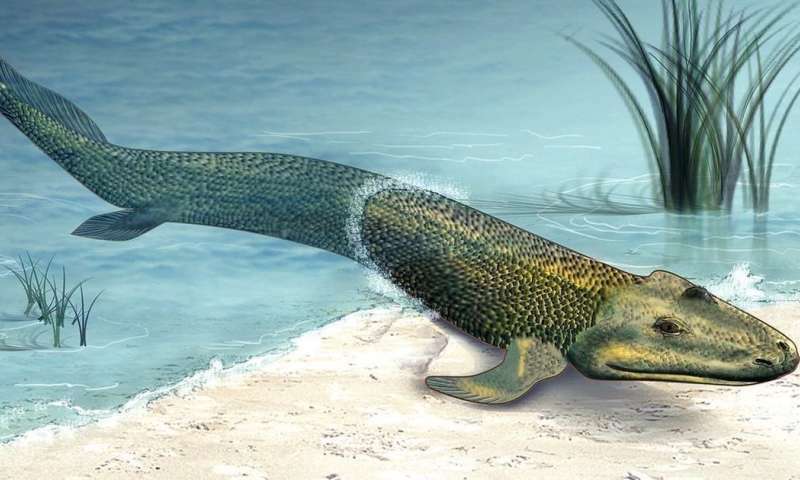 It also means that the Tiktaalik is likely not the first fish on the moon as in the childish cartoon but just another plain old fish - like this 'walking' fish. "creature, which hasn't changed much over the ages"
- "living fossils" should stand for "no such thing as evolution". The rest is pure BS. Very funny.